The tradition began a few years ago. A coachload of villagers from my pueblo and a nearby one had gone off on a holiday together to Almería in the autumn. On one of the excursions, somebody said they wanted to nip off and buy a Christmas lottery ticket. Suddenly everyone around decided to go too, and the coach returned from Roquetas del Mar with people clutching over 200 of the precious lottery tickets, for themselves and for presents within their families. And the luck fell their way. Forty-four pensioners from Villanueva de la Concepción and another twenty or so from Colmenar, plus all the lucky recipients of the lottery ticket gifts, won a serious lump of cash each. Let’s just say that if anyone had a mortgage or a massive credit card bill, they don’t any more. So ever since, a “lottery stop” has become a built-in, unmissable and obligatory part of any of the pueblo excursions. And it’s very difficult to avoid taking part – imagine being the ONLY one on the coach that doesn’t have a ticket! Thus I found myself passing handfuls of euro notes up the coach, and adding my own 20€ to buy one single “décimo” ticket for “El Gordo” (the Fat One, the nickname of the big Christmas lottery). We were on our way to Madrid to see “The Lion King”. The volunteer at the front was carefully noting each person’s name and the number of décimos they were buying. The cash was shoved into a deep leather bag. 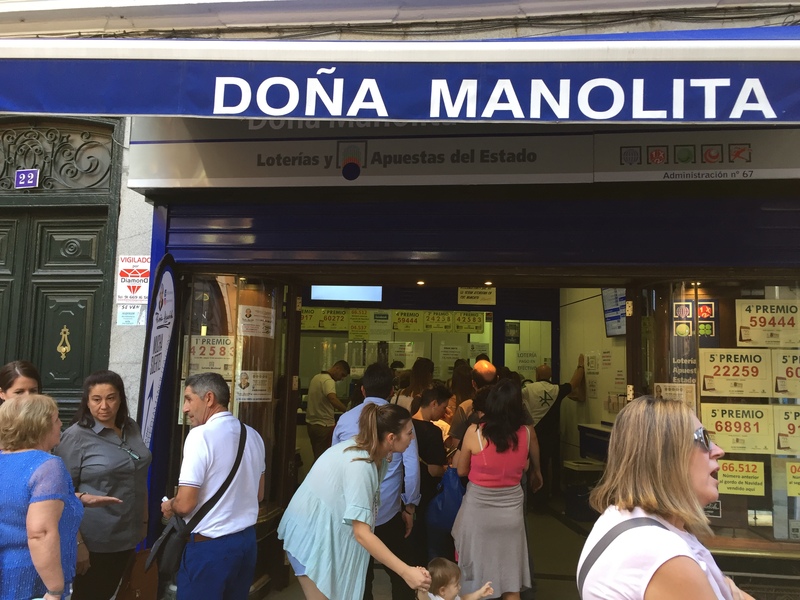 Once in Madrid, our long-suffering guide tried desperately to interest us in a bit of Madrid’s history, but more attention was being paid to where exactly the famous kiosk could be found – reportedly the luckiest lottery vendor in the whole of Spain! Walking up the beautiful main street, La Gran Vía, the guide pointed out the theatre where “The Lion King” was on, and the restaurant opposite where we would meet to dine beforehand. Half of us were listening, the other half were checking the Maps application on their phones, looking for Calle del Carmen 22, the location of Doña Manolita, the kiosk where our tickets were to be bought. The guide led us off towards Puerta del Sol, an important plaza that hosts major political rallies. The last time I had been there, back in 2011, it was full of tents and makeshift communal kitchens, libraries and creches, as the Indignados occupied the square, starting a worldwide movement (and launching the new left-wing Spanish political party, Podemos). Today it was calm, with just one small demonstration of half a dozen people protesting against new Israeli settlements in Palestine. The guide struggled in vain to keep the attention of the group – Juan had checked his phone and the famous kiosk was mere yards away! In the middle of some explanation about something or other, a splinter group snuck off (tightly clutching the leather bag from the coach). I waited politely until the guide had finished, then sprinted after them, finding Juan still in the queue outside Doña Manolita’s. The Policía Local had put lines to keep the queue in order, and were there to check that nobody tried queue-jumping. Juan reached the front and handed over a really rather significant wodge of cash, buying tickets for 62 of us, many buying for extended family members. As we left with our large heap of décimos, the queue had become even longer. For many, this is money they can barely afford, being thrown away on a never-to-be-fulfilled dream. For a few, it will be the end of struggling, working three jobs, and being unable to give their children everything they want. Even at 20€ a go, more tickets are sold when time are tough. There’s always just that chance, isn’t there? Ojalá que me toque. It could be me. Meanwhile, back on the bus to return home, we played bingo. I had the good luck to NOT be the first to fill a line, as the prize was a pair of pants, won by Josefa, who paraded up and down the coach wearing them on her head. ¡Ojalá que no me toque! But it didn’t end there. 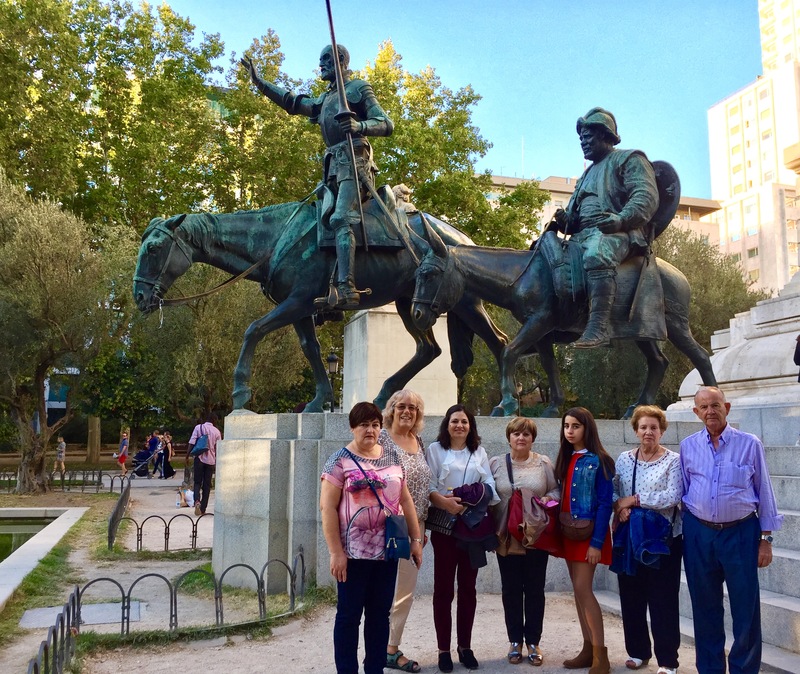 In November we went away again, to Murcia, again with some villagers from Villanueva de la Concepción, with whom the luck had been shared a few years ago. Again the list was made, the money collected, and the precious Lottery décimos bought and distributed. 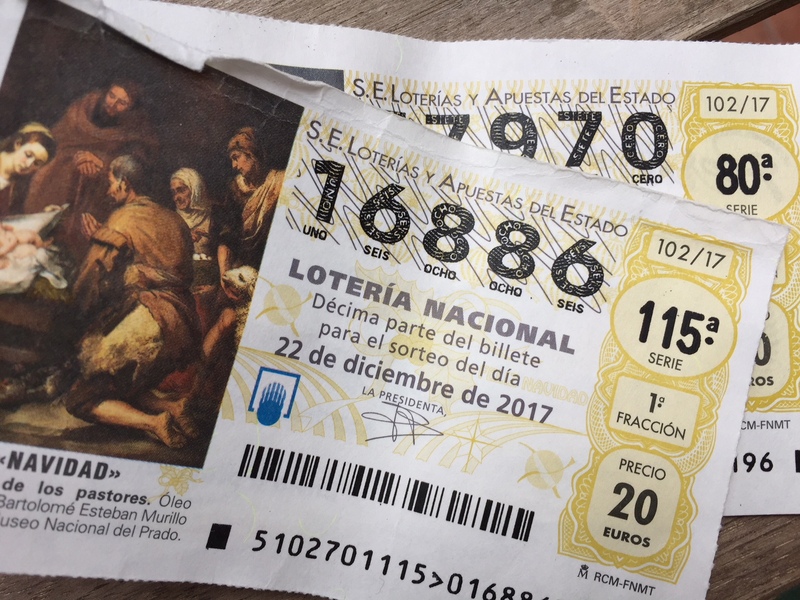 The Christmas lottery in Spain is run by the state. During the year the main lottery is run by ONCE, the national charity that helps blind people find work. Kiosks all over the country are staffed by people with disabilities, while others are licensed to sell the lottery tickets from strips that they carry around bars and restaurants. Almost 80,000 people, all of whom are registered as blind or have another disability, make a living through ONCE. So at least, if you aren’t a winner, the money has gone to a genuine charity, and at a MUCH higher rate than the UK lottery (where less than 5% of the funds go to charities, the other “good causes” being state responsibilities such as the NHS, education, sport etc). So on December 22nd, the children of San Ildefonso school will sing out the numbers, bars all over Spain will be showing the lottery programme, families will gather round the TV, and the precious décimos will be spread out on the table. It’s a décimo because you just buy one tenth, so if you buy lots then everyone in your family has the same number. If one wins, you all win. I will line up my ticket from Doña Manolita in Madrid and my ticket from Murcia. And if we don’t win, the ritual of the singing children (video here) will remind me of those two trips and the fun we had. In addition I’ll buy at least one bought from a shop or club or bar in my own pueblo. That’s important, because if one wins you all win. And what better than to celebrate a win, be it large or small, with your neighbours? 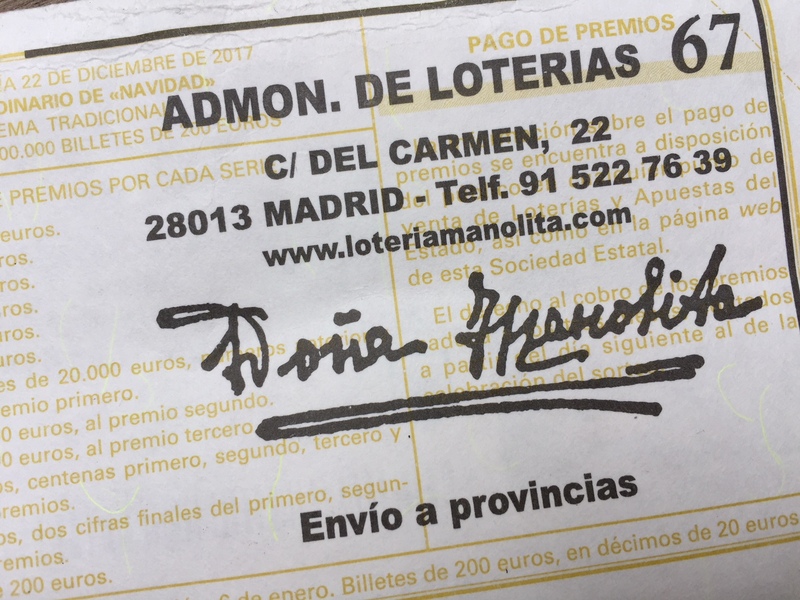 This entry was posted in Spain and tagged Christmas, Doña Manolita, El Gordo, Lottery, Madrid by tamaraessex. Bookmark the permalink. Buena suerte! I lived in Tenerife for many years and well remember the anticipation of El Gordo. Well narrated!